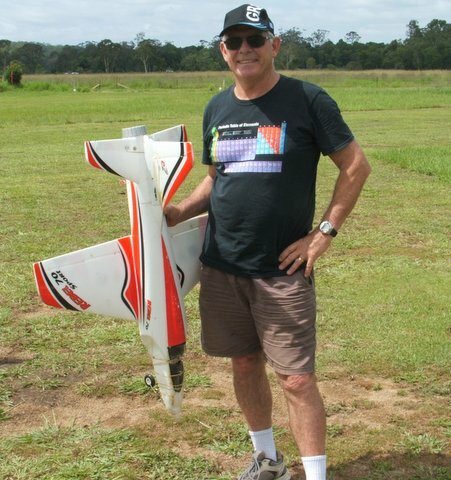 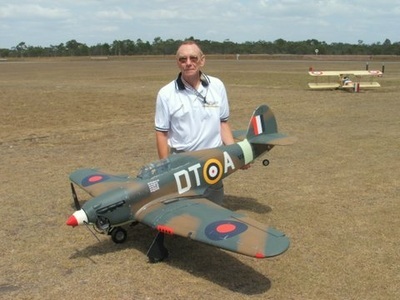 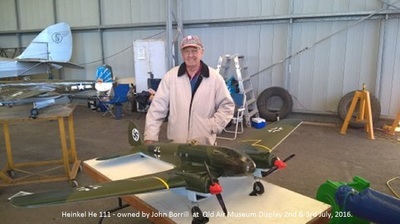 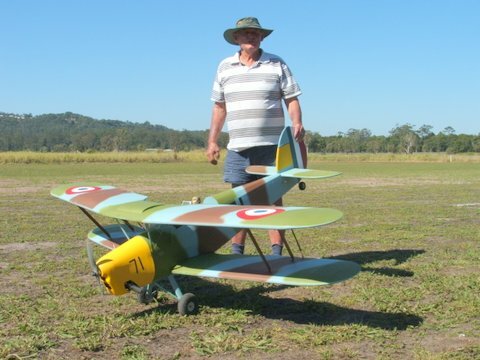 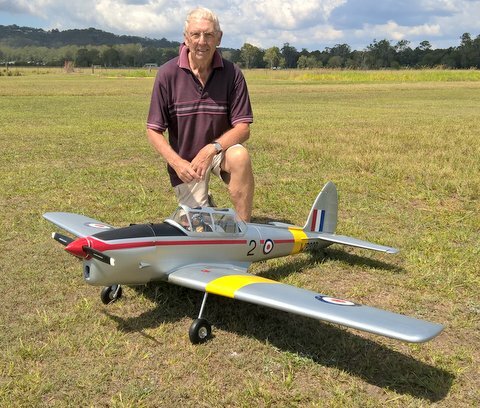 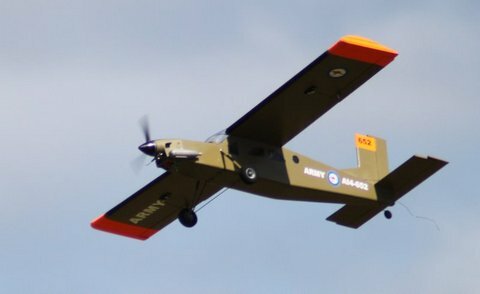 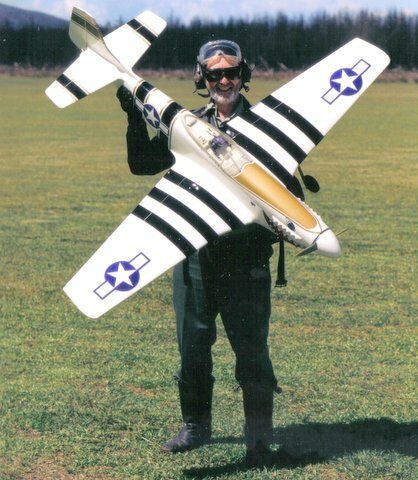 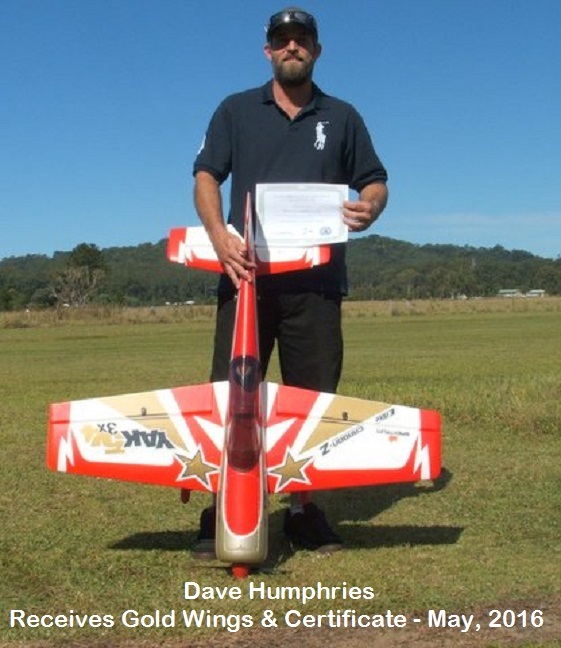 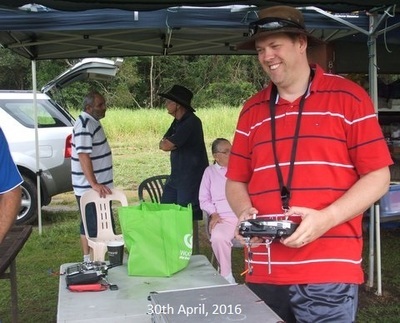 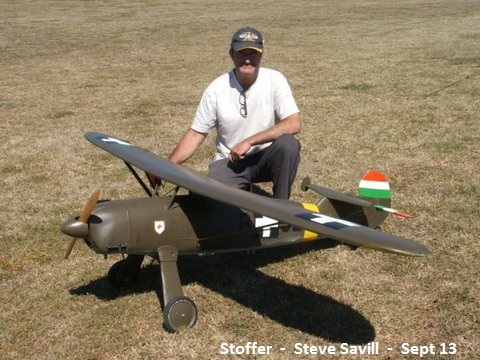 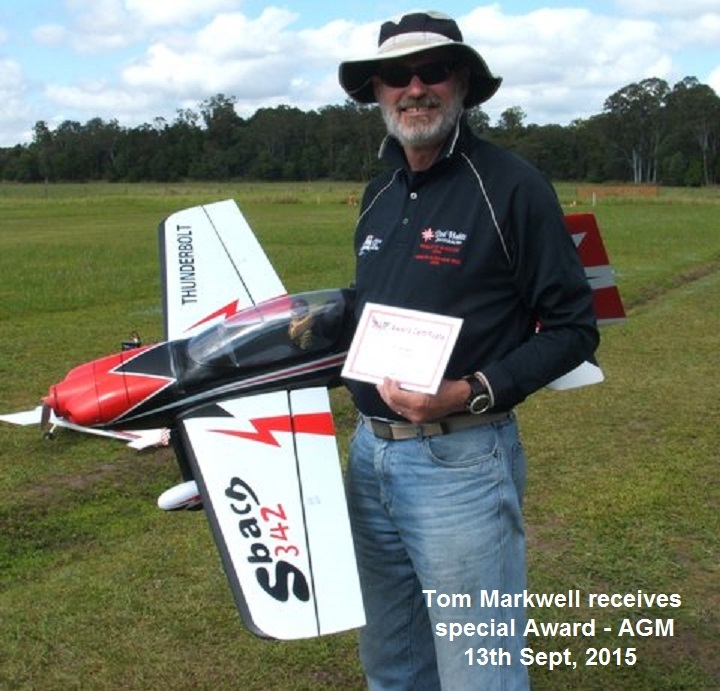 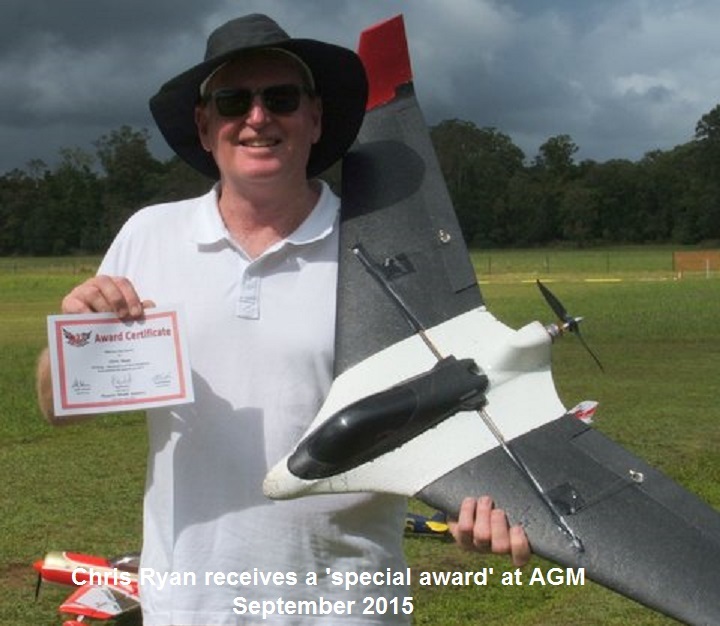 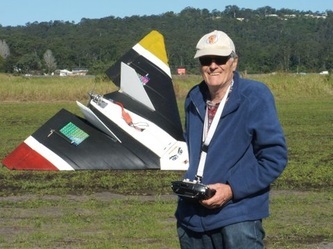 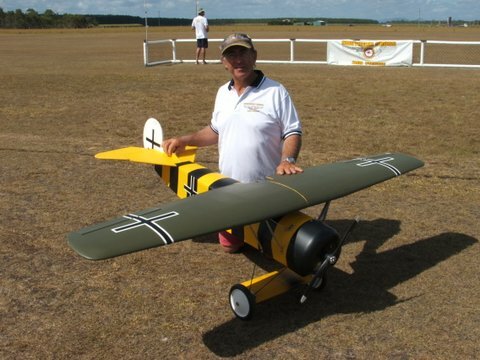 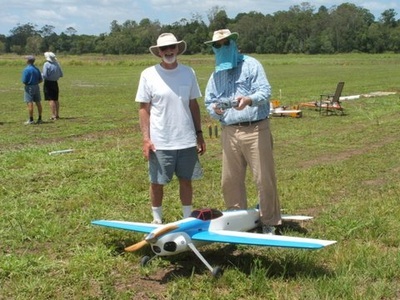 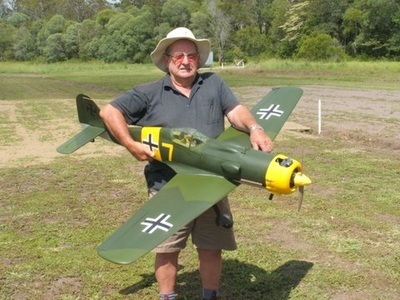 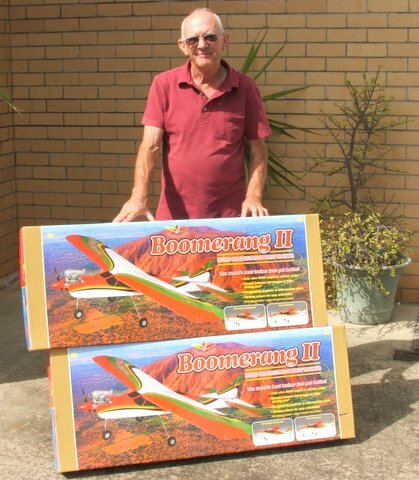 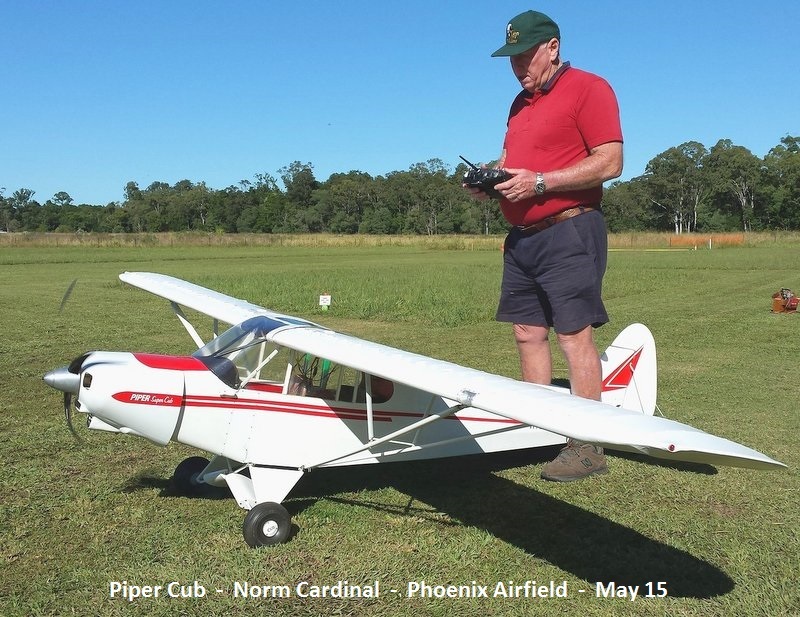 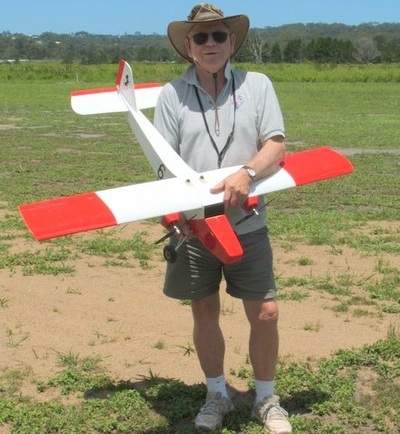 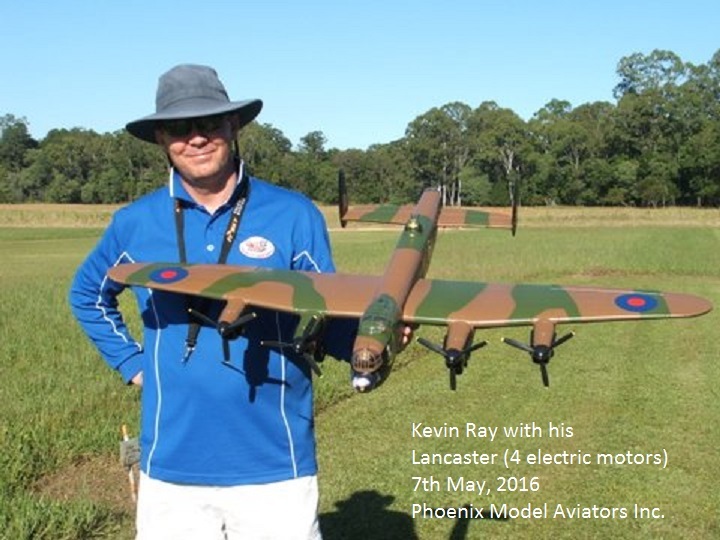 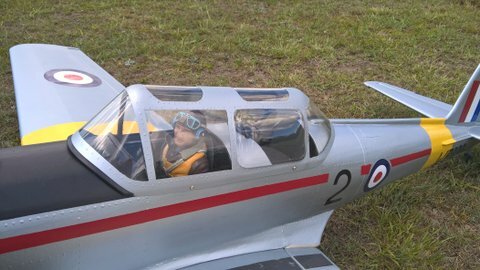 John Borrill with his new Chipmunk which was test flown 12 March at Phoenix Airfield. 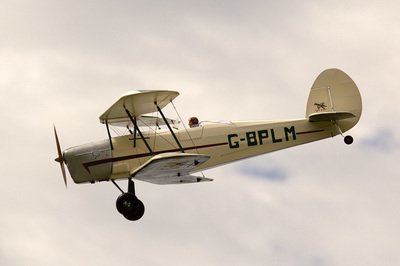 The canopy and cowl mould were supplied by Peter Johnson. 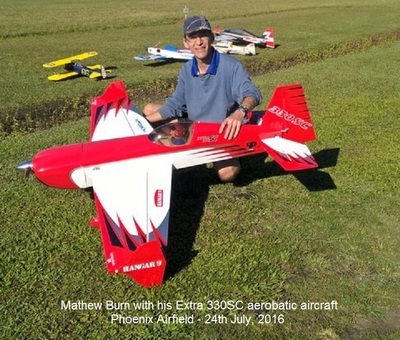 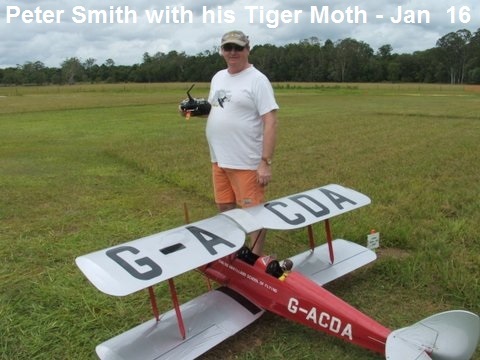 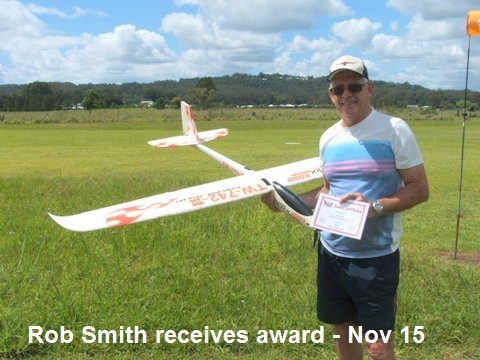 Dave Humphries - "Extra 300"
John Borrill - "Tiger Moth"
Making the transition from smaller 'foam' sports aircraft to a much bigger 'built up' aerobatic aircraft is Mathew Burn (pictured above) with his new Extra 330SC aircraft. 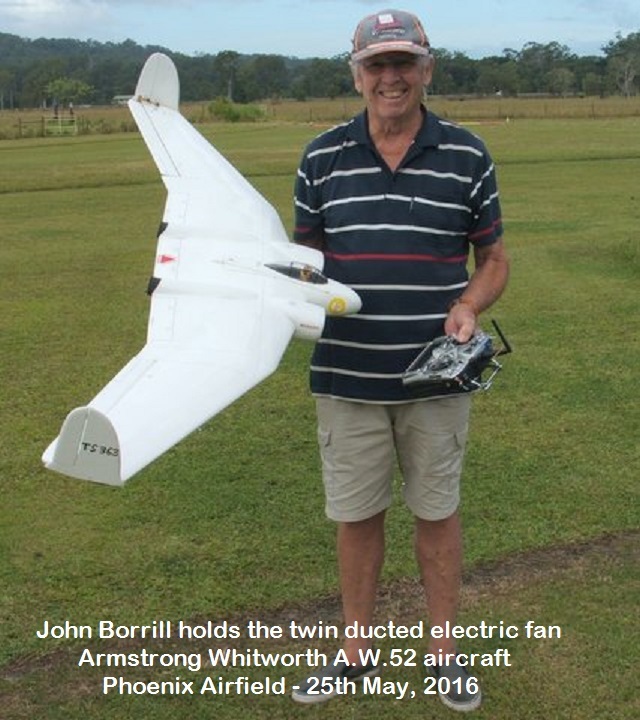 Looking very happy with himself is Jon Bennison. 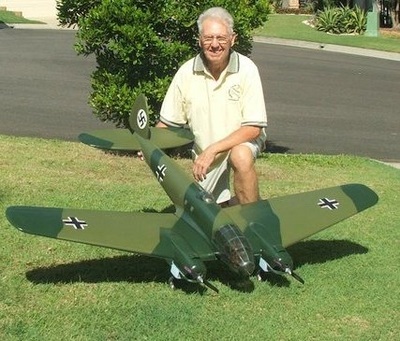 He recently obtained his Bronze Wings and is now the proud owner of a new Challenger aircraft. 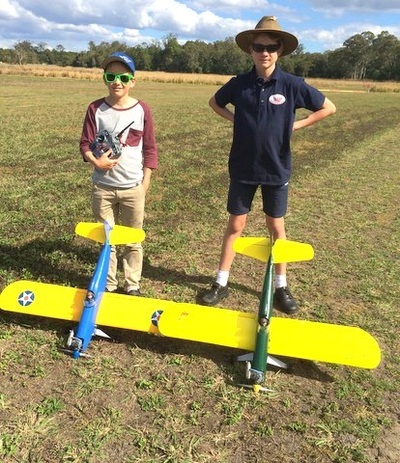 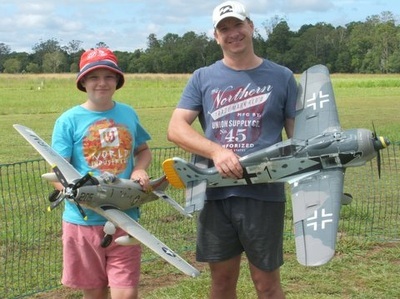 Father and Son team Sean Senbruns (right) and Luke Senbruns (left) display their 'Warbird' Park Flyer Aircraft. 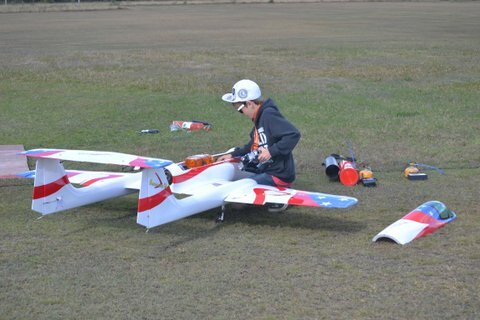 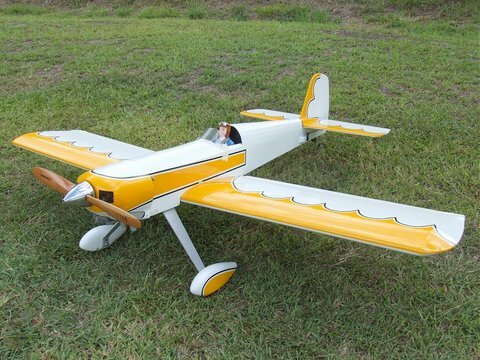 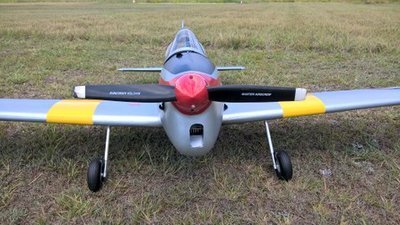 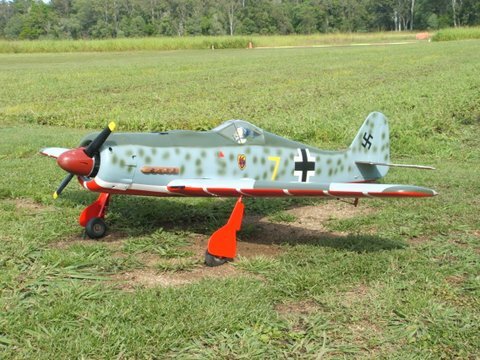 These beautifully painted aircraft are constructed of styrofoam and are powered by an electric motor. 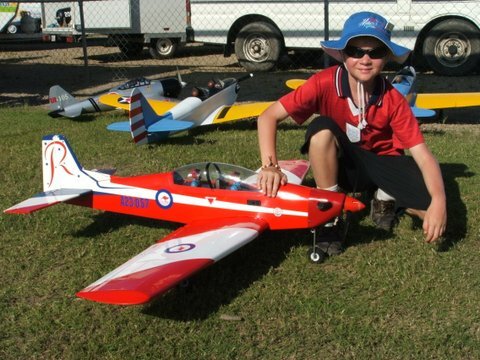 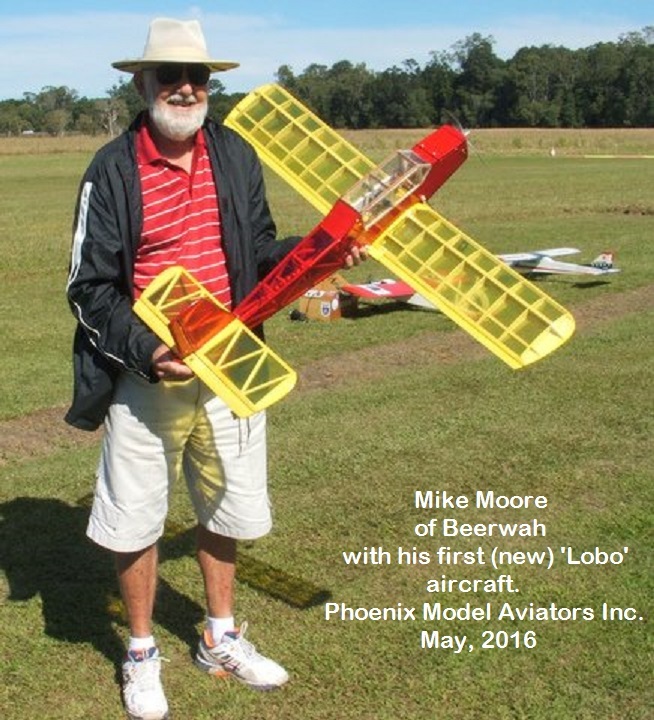 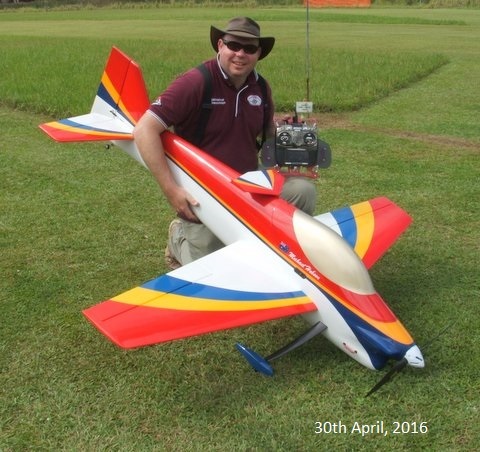 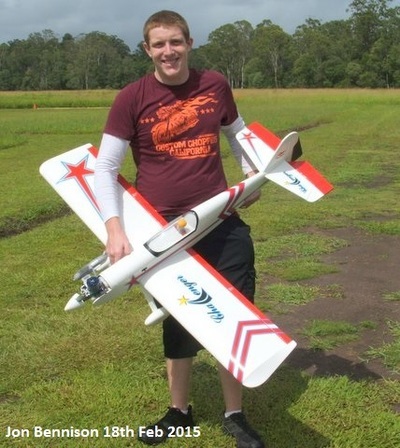 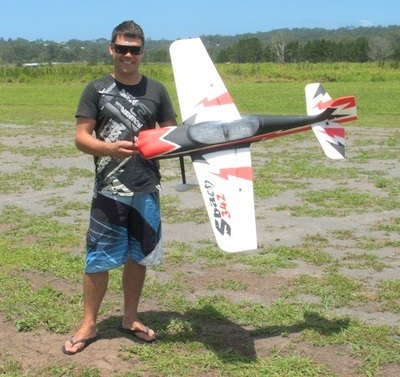 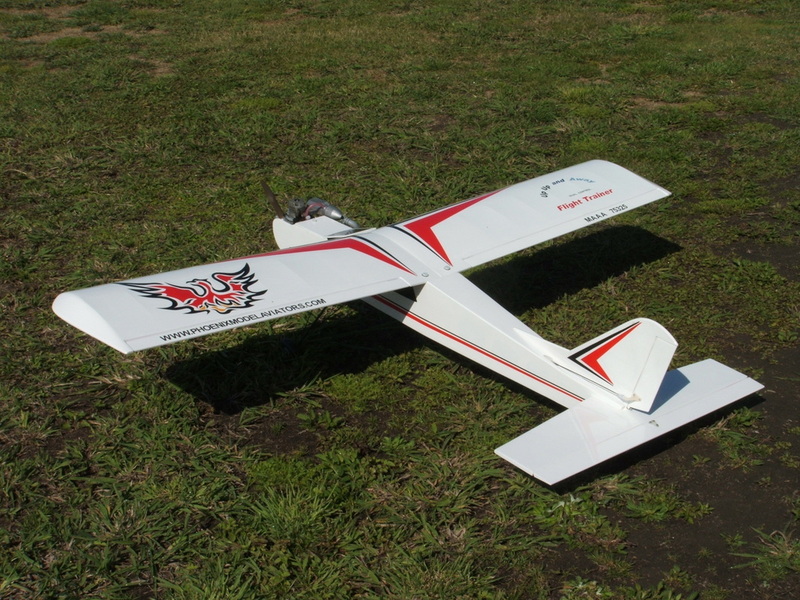 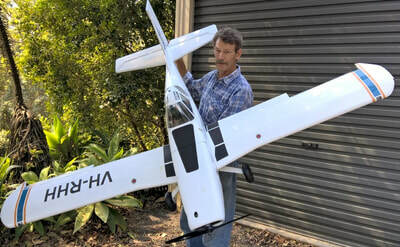 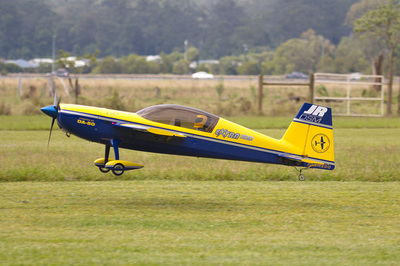 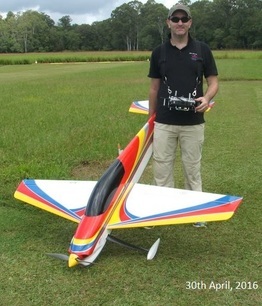 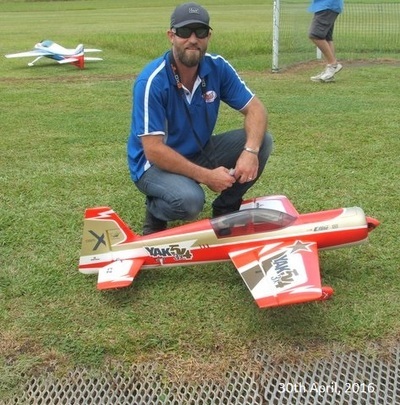 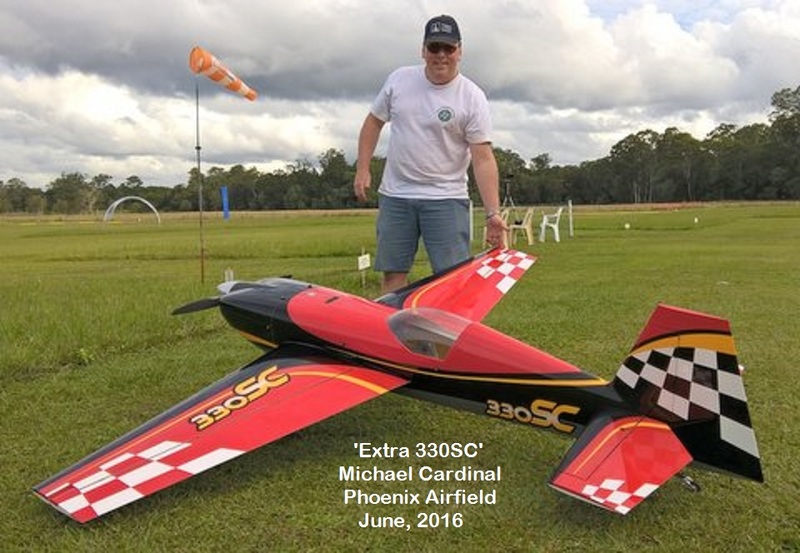 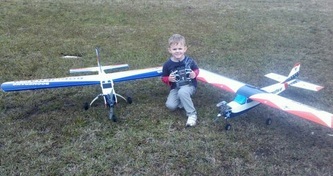 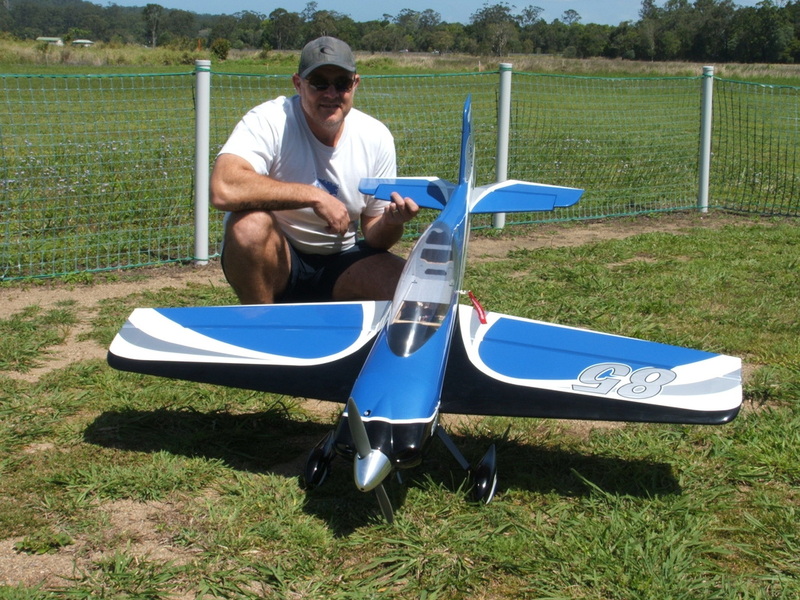 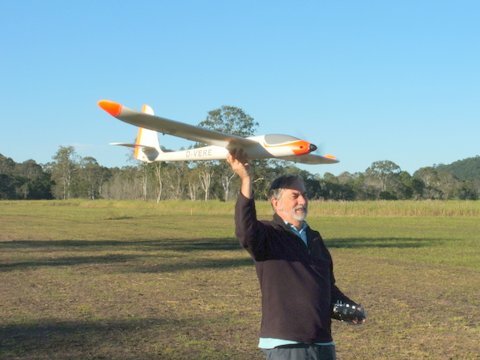 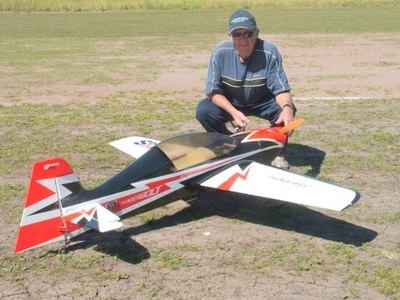 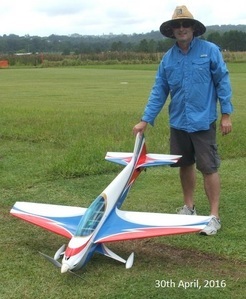 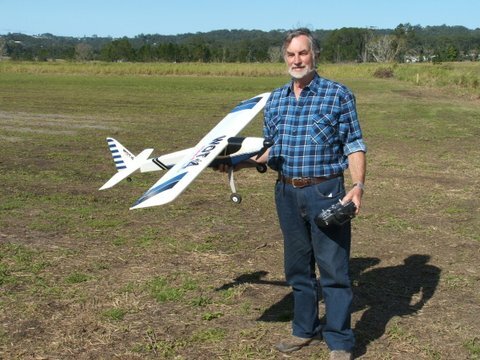 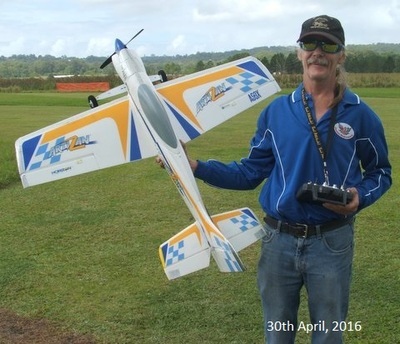 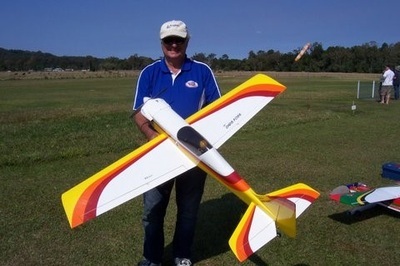 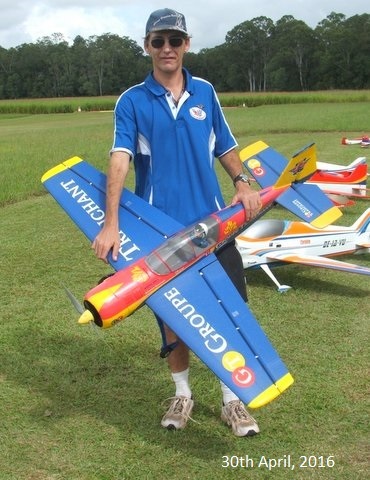 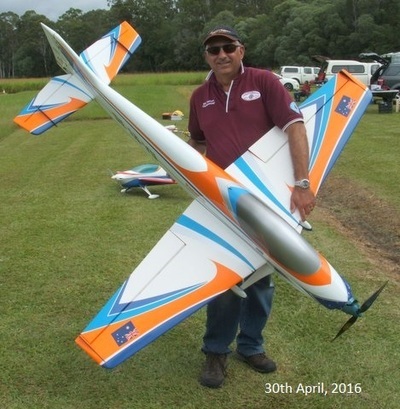 Rob Smith displays his jet park flyer aircraft. 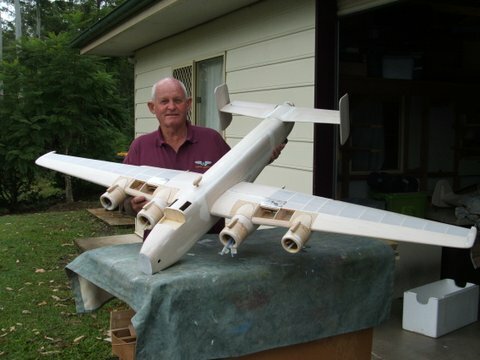 It is constructed of styrofoam and is powered by a 'ducted fan' electric motor. 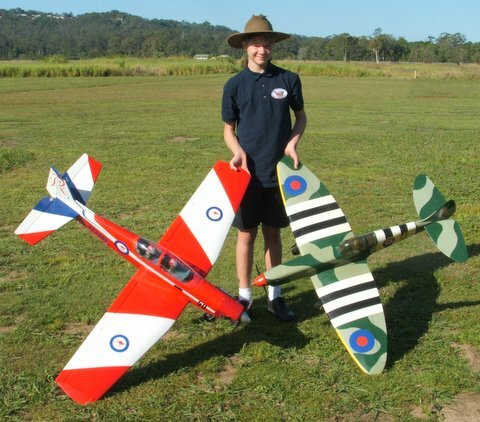 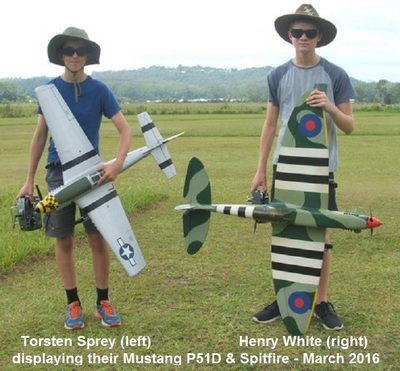 Henry White holding the Red & White PC 9 and the very quick Spitfire - All aircraft powered by a 46 engine. Gordon Reed's electric powered 'Dream Flyer'. 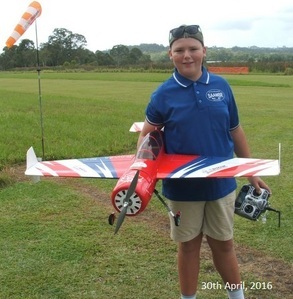 Henry White with his PC 9 - Ready to go. 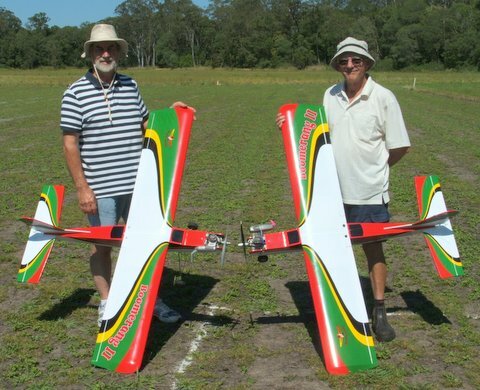 Brian Victor & Mike Moore - The old and new gliders. 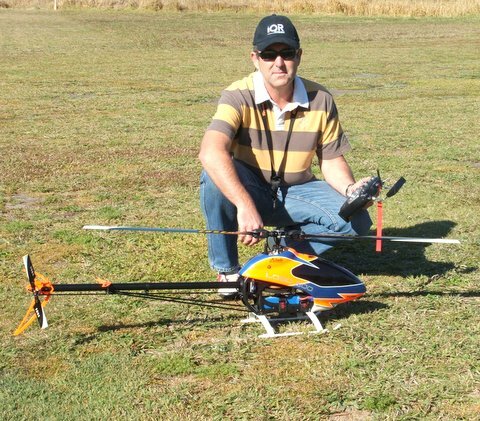 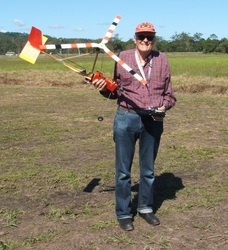 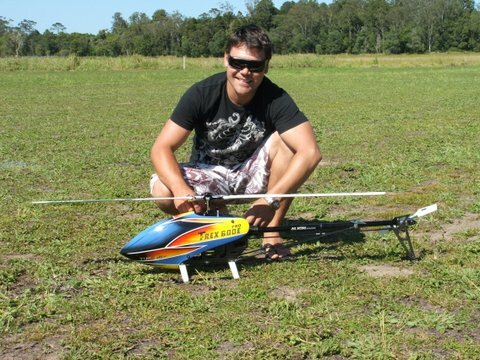 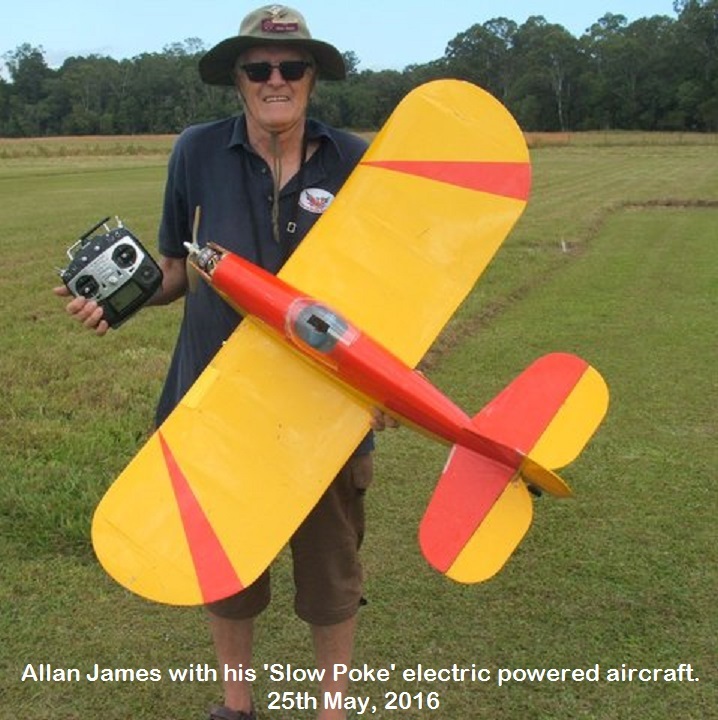 Alan James with his Auto Gyro electric model. 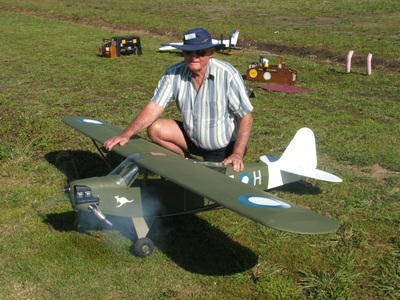 Bill Rogers with his 1933 Stampe. 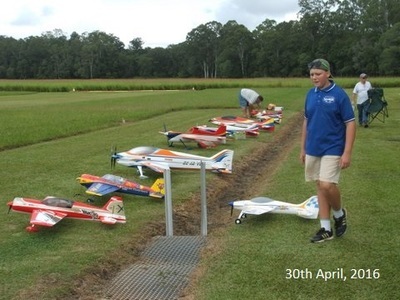 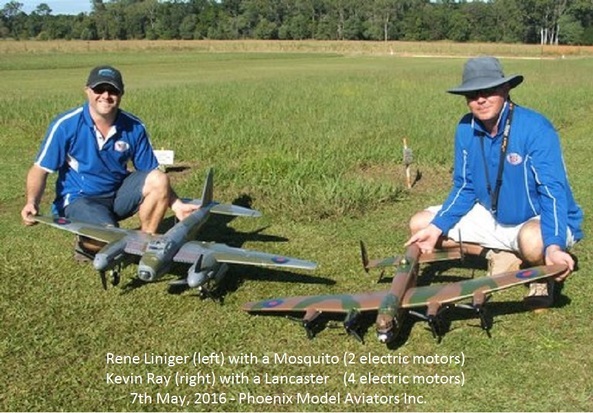 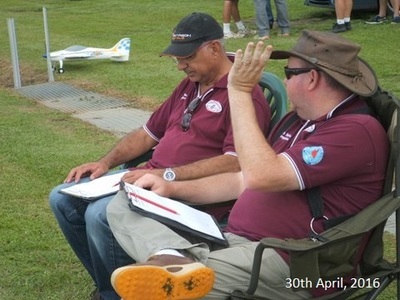 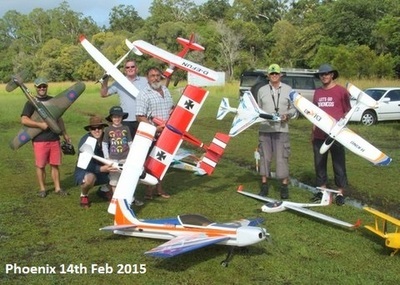 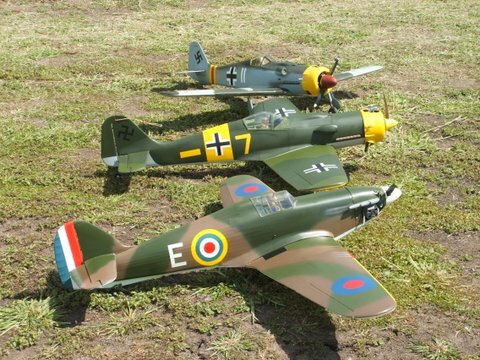 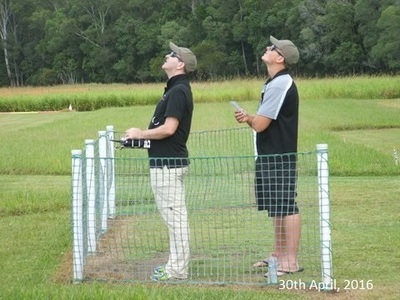 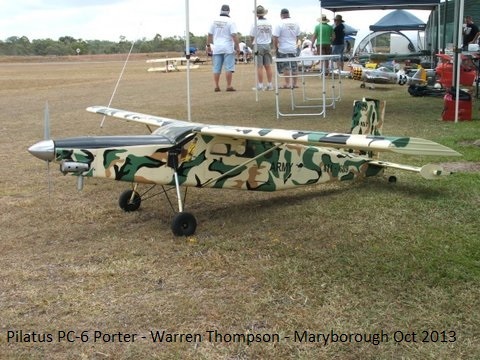 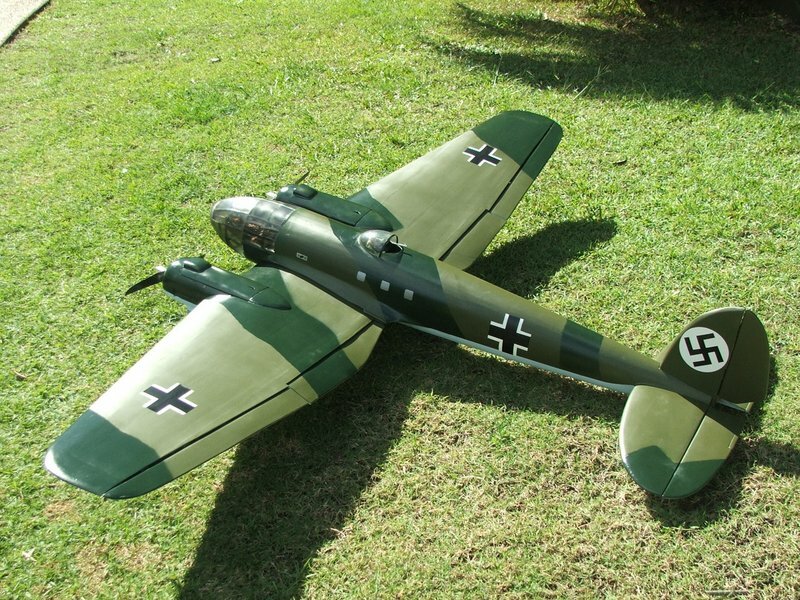 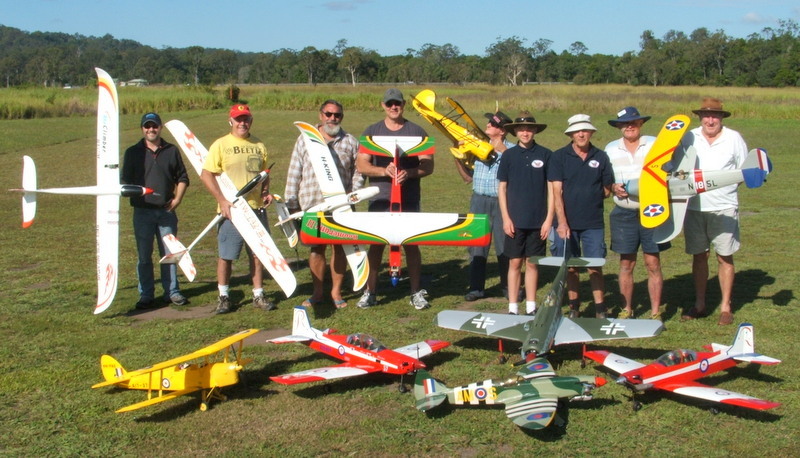 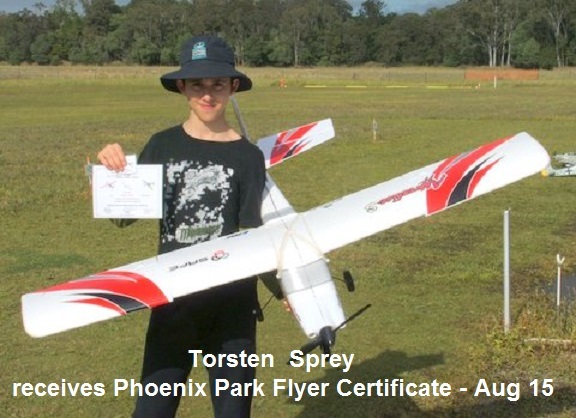 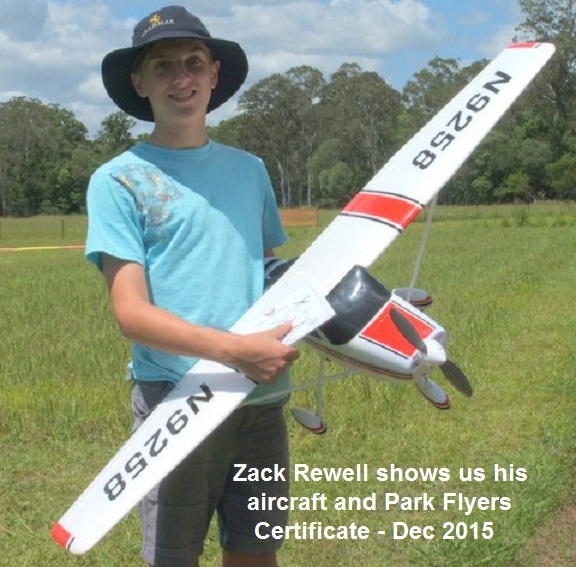 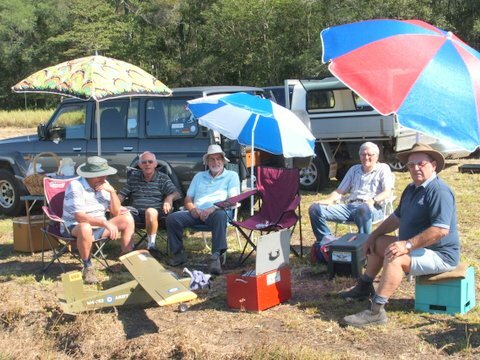 Roger's Aircraft Maintenance Services of Nambour is once again turning out some excellent aircraft for public display. 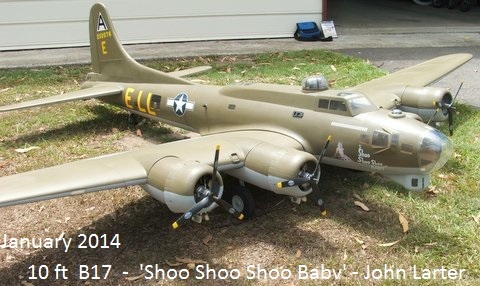 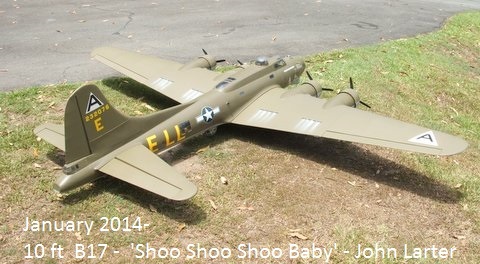 John Larter who is a member of Suncoast Model Flyers will be test flying his new B17 named 'Shoo Shoo Shoo Baby', within the next few weeks. 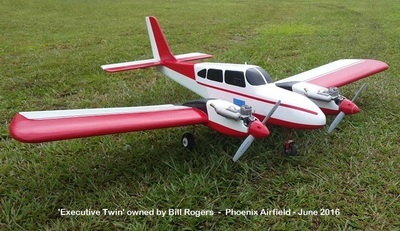 This aircraft powered by 4 Saito 56 engines with a wingspan of 10 foot, has been beautifully finished by Bill Rogers. 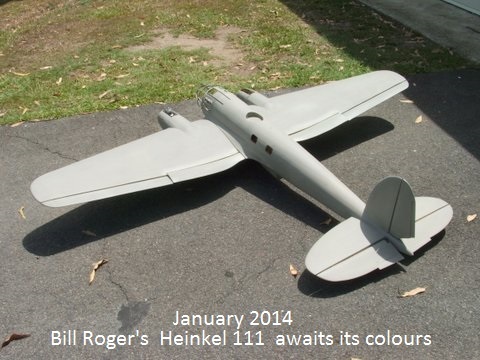 The aircraft in grey awaiting its final colours is a Heinkel 111. 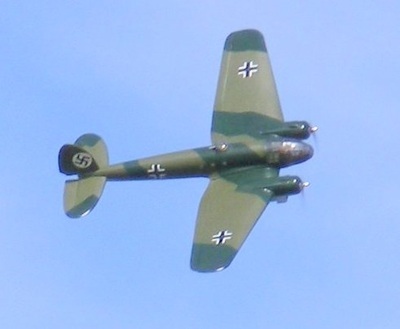 Powered by 2 OS 25 engines it is a replica of the WW 2 German bomber. 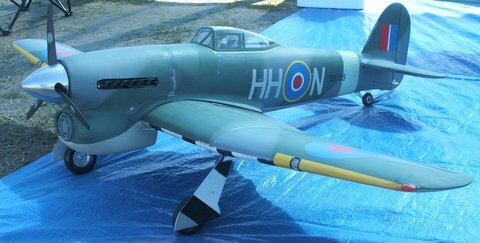 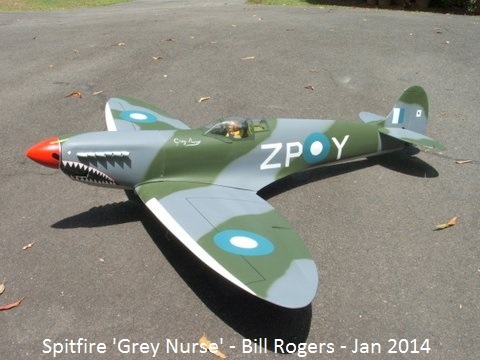 The Spitfire known as the 'Grey Nurse' is now ready for its test flight. 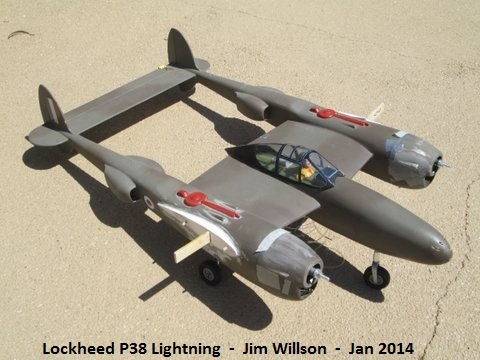 This Lockheed P38 Lightning, built up from plans was originally owned by the late Ron de Chastel. 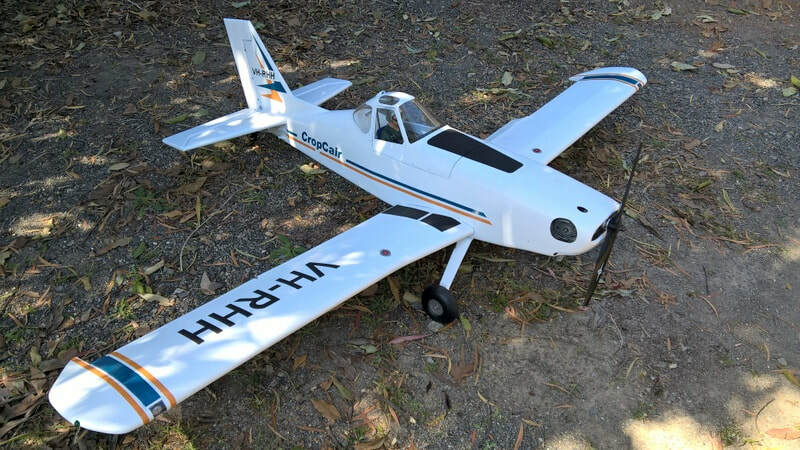 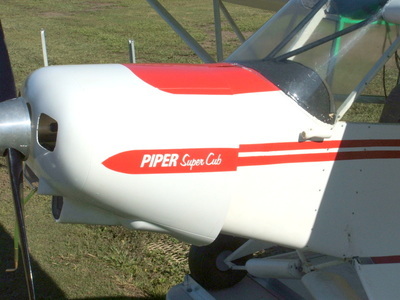 It has had four owners over past years and is currently being restored by Jim Willson of Caloundra who is a member of Phoenix Model Aviators Inc. 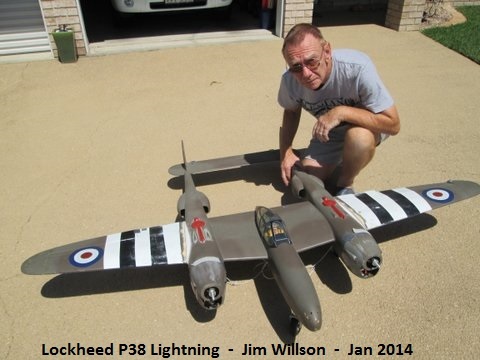 Although it was equipped with two .25 motors, Jim is refitting it with 2 x Axi 2810 x12 electric motors to run from 2 x 4 cell 4000ma Lipo batteries. It will also have Spring Air retracts. 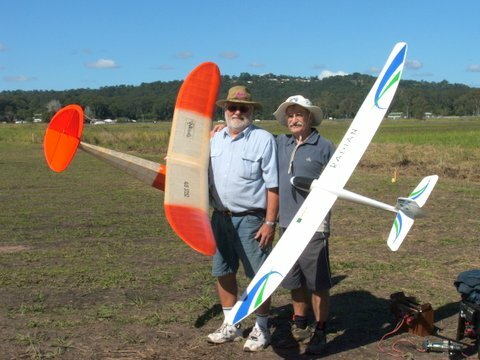 The wings have been cut into three sections for easier transportation. 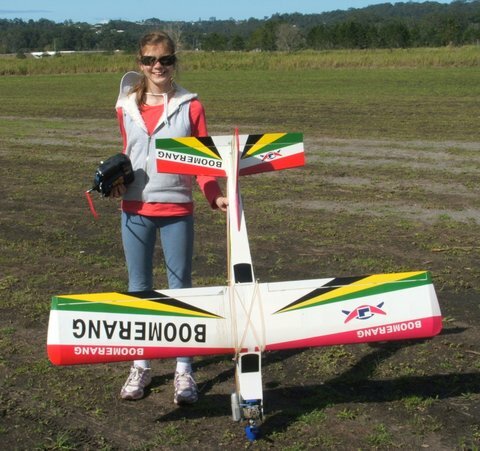 The wing span is 72" (1.840mtrs) and the aircraft weighs 5 kg. 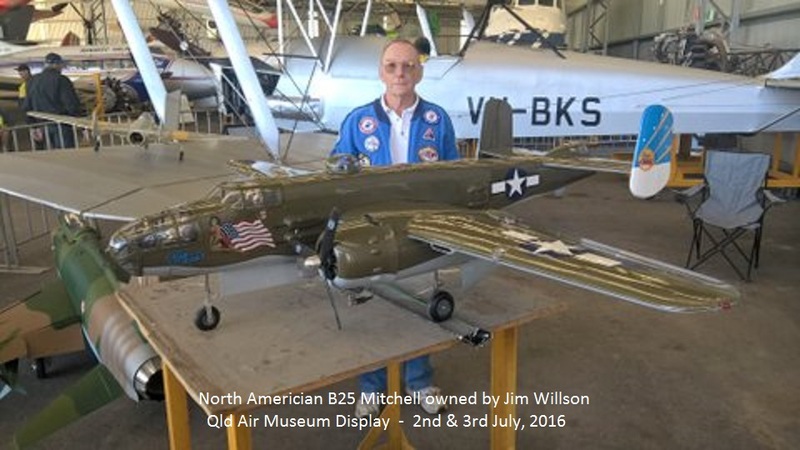 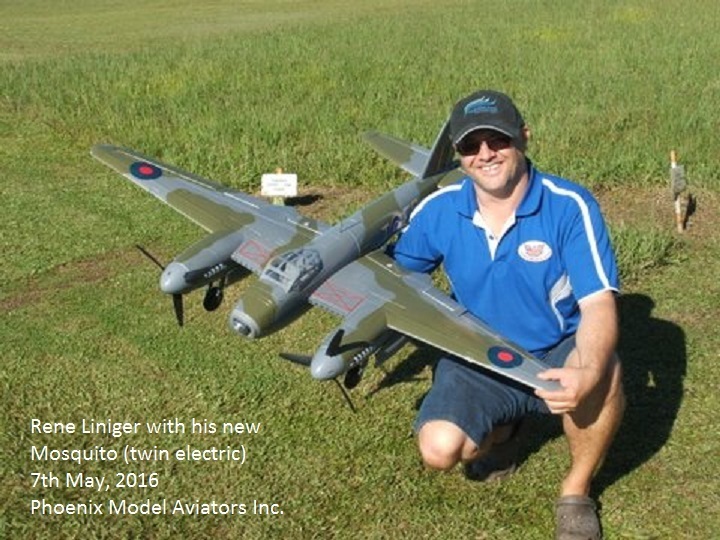 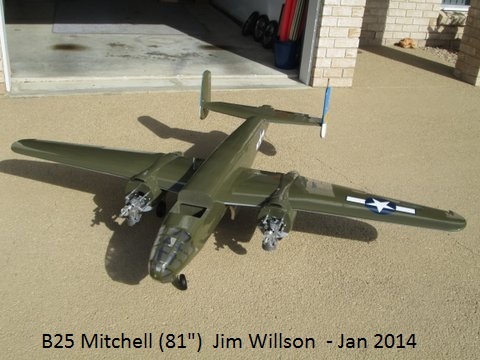 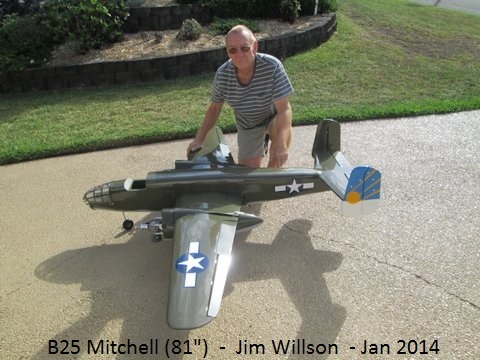 Jim Willson of Caloundra has almost finished an 81" / 2060mm B25 Mitchell bomber. It is a Hangar 9 ARF and two 15cc RCG petrol motors have been installed. 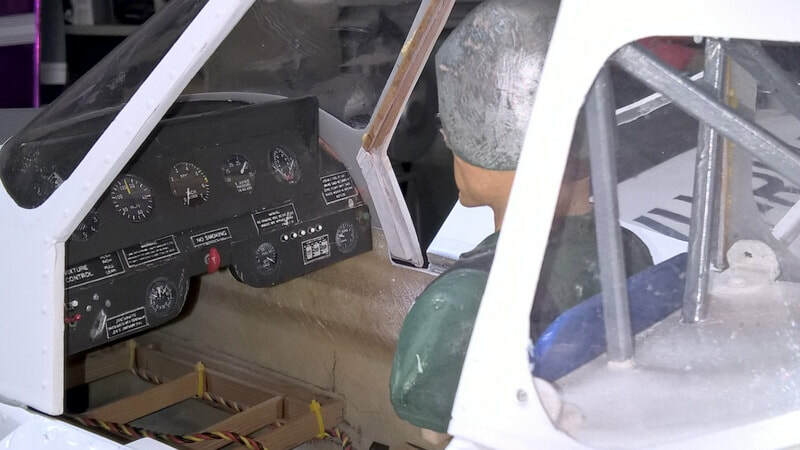 The aircraft will have 10 servos and it will be equipped with electric retracts, flaps and bomb doors. 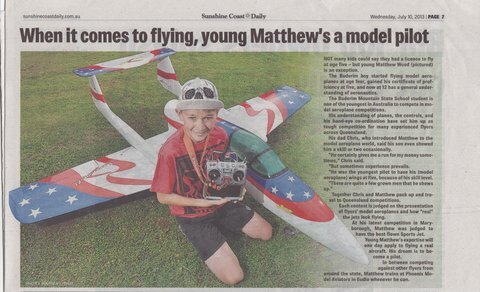 We look forward to seeing this one flying over Maroochydore.